Russia's actions in Ukraine have prompted the Canadian government to forego a planned launch of its M3M satellite atop a Soyuz rocket this summer, Canadian satellite manufacturer COM DEV International announced April 24. The satellite, a small maritime ship-tracking spacecraft, was previously scheduled to launch as a secondary payload on Soyuz from the Baikonur Cosmodrome, Kazakhstan, in June. "Recognizing the current events in the Ukraine, we had been engaged in discussions with the Government of Canada with respect to a potential delay of the launch of M3M, and plans to mitigate the impact of any delay," said COM DEV CEO Mike Pley. "We are confident that the mitigations will be in place prior to the originally planned M3M in-service date of September 2014." Built by COM DEV under contract to the Canadian Space Agency/Public Works Government Services Canada and the Department of National Defense, M3M is also subject to a commercial data sharing license with exactEarth, in which COM DEV is majority owner. “Both COM DEV and exactEarth made significant investments in the development of the satellite, and in upgrading its capabilities,” according to the Aprl 24 statement, which said the Canadian Space Agency has indicated it will support the company's efforts to secure a new launch. In March, as Moscow consolidated its hold on Crimea, the U.S. State Department suspended approval of defense exports to Russia, a move that could prevent the launch of U.S. commercial communications satellites on Russian rockets. “State will continue this practice until further notice,” the department’s Directorate of Defense Trade Controls (DDTC) said in a March 27 announcement on its website. DDTC export licenses are required to launch U.S. satellites —or foreign-built satellites containing U.S. components controlled by International Traffic in Arms Regulations (ITAR)—on Russian launch vehicles. If the ban on issuing such licenses remains in effect, the impact would be felt most immediately by International Launch Services (ILS) of Reston, Va., and Sea Launch International of Nyon, Switzerland; ILS markets launches on Russian Proton vehicles, while Sea Launch manages flights on Russia’s Zenit launcher. However, launch industry sources said the hold could potentially affect Soyuz launches from Baikonur Cosmodrome in Kazakhstan and Europe’s Guiana Space Center in French Guiana, where launch consortium Arianespace manages commercial missions of the four-stage, medium-lift Soyuz. 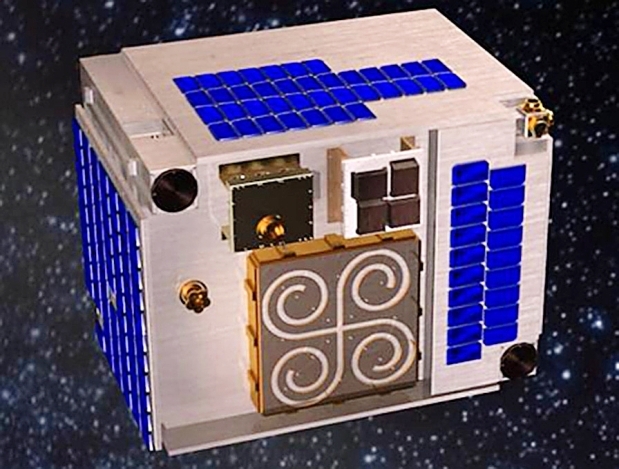 M3MSat is a tele-detection satellite, and its mission is to demonstrate and test the technology of three instruments. The Conservative government’s hard line on sanctions against Russia has scuttled the launch of a key Canadian military satellite that was to be put into orbit by a Russian rocket. Officials with the Canadian Space Agency and the spacecraft’s builder, Com Dev, are now trying to find another country or private company willing to send the surveillance satellite into space. The move to cancel the June 19 launch of the satellite comes as the Canadian government continues with sanctions against Russia over the situation in Ukraine. On Tuesday, Russia expelled a Canadian diplomat in Moscow, labelling him a spy. Com Dev issued a statement Thursday night that it would not proceed with the launch of the spacecraft known as M3MSat. Canadian Space Agency spokeswoman Maya-Olivia Eyssen said the satellite was to have been launched from Russia’s facilities in Kazakhstan. “The Government of Canada is working with Com Dev to find an appropriate launch solution,” she noted. M3MSat will provide maritime surveillance and work in conjunction with another Canadian spacecraft, Radarsat-2. The Department of National Defence’s science agency is supporting M3MSat, with help from the CSA. The spacecraft is outfitted with sophisticated technology to allow it to track digital signals transmitted by ships. That would make it possible to identify and record marine traffic, know vessels’ direction and cruising speed and ensure that they navigate legally and safely in Canadian waters, according to the DND and the space agency. The launch of another two smaller Canadian satellites to be sent aloft on the same rocket have also been scuttled. There are no details on how those spacecraft will be put in orbit. 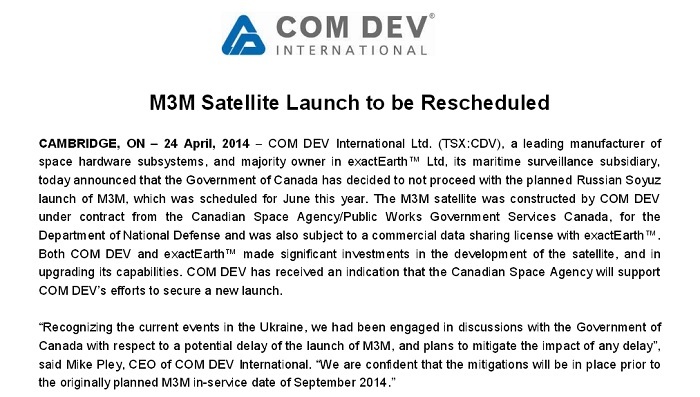 In its statement, Com Dev noted it was the Canadian government that decided not to proceed with the planned launch. DND declined to comment, referring all questions to the CSA. Russia has indicated it is more than willing to launch the Canadian satellites, say sources. The Canadian government’s sanctions against Russia could put Canada’s space industry in a bind as there are a limited number of nations and private companies capable of launching satellites. Walt Natynczyk, the head of the Canadian Space Agency, said in mid-April that sanctions against Russia would not affect operations on the International Space Station. Canada would continue to work with Russia and the other nations involved in the station, he added. Co-operation on other space projects, however, will be decided on a case-by-case basis, the former general noted. Com Dev built and tested the spacecraft at its facilities in Cambridge, Ont., and Ottawa. It is unclear whether the Canadian government will cover any extra costs that might be incurred in finding a country or firm willing to launch the spacecraft at such short notice. “Com Dev has received an indication that the Canadian Space Agency will support Com Dev’s efforts to secure a new launch,” the company statement added.